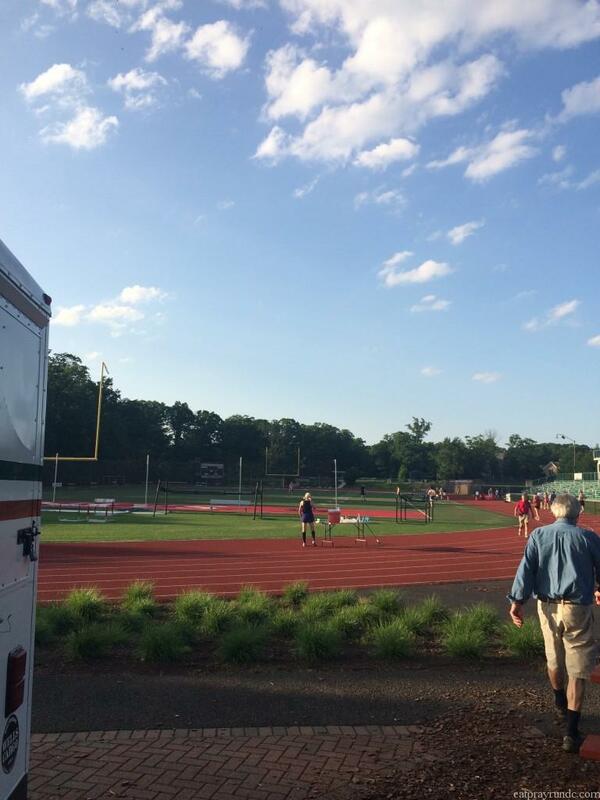 On a bit of a whim, I decided to run a one hour track run last night hosted by the DC Road Runners. Remember, when I joined the Road Runners for low key runs and races? Well, this was one of them. I’d been feeling ill over the weekend so wasn’t sure how the run was going to go (and it is hot as hades here in DC) but I figured I’d just head out there and get in about six miles. I woke up on Tuesday with a weird twinge in my back and almost thought about not going to the run but just told myself I’d take it really really easy. The temps were in the low 90s at the start of the race and I’d convinced Julie to join me for company. Before I knew it, it was time to start! There were just under 30 runners, most of them men (I counted 6 women total, including Julie and I). We were each given a popsicle stick labeled with our bib number that we were to drop once time was called. Then the run officials would calculate our total distance, including that final lap. The group looked…fast. You know what I mean. Tall, lanky men with no shirts and no body fat. Yeah, it was that kind of group. However, since it was a track run, it didn’t matter because we were all restricted to the same loop. We started out and Julie and I reviewed our plan. We were going to work in the Oiselle track workout of the week. A six lap (1.5 mile or roughly 15 minute) warmup and then a 400 at 5k pace (typically 5k pace is in the 8:xxs but we adjusted that to be in the 9:xxs given the heat and me not feeling well) and then 1200 at marathon pace (low 10s). We would do that sequence three times total and then just cruise for the last 20-30 minutes of the run. Julie and I started off nice and easy, and found a comfortable pace. There’s not too much to describe with a track race because it’s just the same thing over and over again. There were a few lowlights though, so I’ll share those. I had a bit of extra protein about a third of the way in when I swallowed a bug. Yuck. I know this happens to runners all the time, but it’s never happened to me before! I tried to avoid it but no such luck. Towards the end of the race, I was really struggling. I was hot, my stomach was churning and it was clear to me that I wasn’t 100% recovered from whatever little bug I’d had. Julie pulled away for the final ten minutes or so and I just focused on trying not to throw up. Yuck again. Not a good feeling. But…all good (and not so good) things come to an end and I survived. Yes, I felt just as pretty as I looked. In the end, out of six women, Julie came in 2nd and I came in 3rd. We’ve been laughing about that all morning. Oh, and four of the men ran 10 miles during that one hour. Yeah…we came just short of six. Would I do this again? Yes, I would. Just not during a week where I was under the weather! 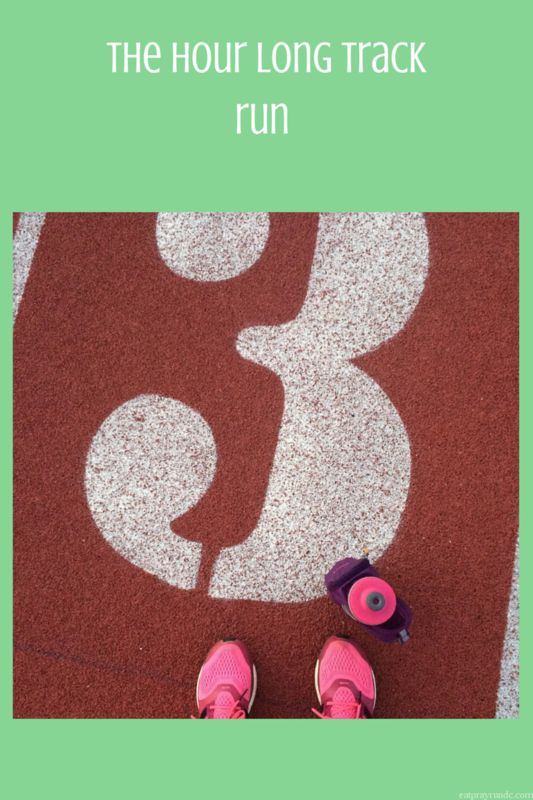 Have you ever run a one hour track run? How’d it go? man, I give both of you SO much credit for this. My legs were killing me after my early morning training sesh so i didn’t want to get out there but that just sounds intense. Kudos to YOU! girl. the weather was hot, but it wasn’t terribly humid and the temps did drop while running but after i ate that bug, i was pretty done. lol. YAY! I’ve been waiting for this post! Y’all did great, Courtney – especially considering the conditions – GAH! I ran my first One Hour Track Run in January; I had a blast, even though our conditions weren’t so great. I think this is a great measure of fitness and I’d like to do it again sometime; I’m glad y’all decided to mix in this workout because, otherwise, it can get a little boring toward the end. I hope you’re feeling better and that you are proud of your accomplishment! yes, doing the oiselle track workout definitely broke it up a bit. the last 20 minutes or so was kinda boring, lol! I have never done a track workout. There are a few offered around town, but most of them are two far to get to at the time they are starting. Boo. Six miles in an hour is pretty great in my book! Well done! Jenn recently posted…disney dream: let’s sail away with mickey! Thanks! It was tough but (kinda) fun! I have yet to swallow a bug but I did have one fly right into my ear and splat and another one do the same in my eye. Gross. I’ve never done a track run like this. The track tends to bore me to tears, but if I had a friend and a plan, maybe I could get through it. SO gross! Track work is hard but this was a particularly nice track (surface wise) which helped a bit! Great run even though you didn’t feel too hot! Yes, I didn’t feel great but I’m glad I did it! Great job!! I’ve never done a track workout before but it sounds killer! My worst bug experience was what felt like a mouthful by the reflecting pool last summer. So gross. Even worse was that it was dark so I didn’t see it coming! Oh goddess that sounds awful!! Yuck! Woah an hour sounds so intense! I’ve done track workouts, but never anything like this. It sounds like an awesome time though! It was kinda tough the last 20 minutes or so – especially with the combination of lingering sickness and heat. Today’s weather would’ve been much more pleasant! This sounds like a fun and different activity. But 90’s? I don’t think I would fare well. Congrats for running in that heat and when you didn’t feel well too. I don’t love them either, they are always SO hard! an hour on a track sounds brutal! props to you both. Towards the end, it definitely was! We were both very tired the rest of the evening. Glad that you were feeling up for the workout! Today marks a week since I was last able to workout, and I think I’m finally feeling up for a walk. Hopefully tomorrow I’ll be able to run again! I hope you can run tomorrow too! Very cool! I’ve never heard of such a thing. I’ve been meaning to join DCRR but haven’t gotten around to it…need to do it asap! Yes you do! So many cheap (read: free) low key races!! I’m not a huge fan of the track for anything other than speedwork. I ran for 45 minutes and walked for 45 during a soccer practice one time and it was totally not my cup of tea. This wasn’t totally awful because we did our speed work during the hour and that took about 40 minutes. Wow Congrats! It sounds extremely grueling especially with the temps and feelig under the weather . Great job! I can’t believe some people ran 10 miles!! I would probably get in 5 or so. But only if I could do a track workout like you did. I don’t think I could run a steady pace for laps and laps around a track! no, that would’ve been awful, i think! I love/hate track workouts. They’re the best way to get faster at all distances, but man do I dread them. I would much rather go for a slow trail run! Wow! What a tough workout! You are strong! I love the track but I’m not sure I’ve ever run a solid hour without stops? Kind of a fun idea. Great job! We’re getting toasty temps around here too, and they do make it tougher! I’ve never participated in a workout like this before, but I think the only way to keep it from being boring would be to do it the way you and Julie did it. You guys had something else to focus on rather than just watching the same scenery pass by over and over. Good job! Thanks Debbie! I’m glad we did it even though it was TOUGH out there! I’m always surprised at how much I like track workouts. I think I swallowed a gnat this morning — gak! Coco recently posted…How Do You Show Appreciation? Yuck – that was my first time eating a bug. Not a fan! I don’t typically train on a track but would love it for speed workouts! It sounds like a fantastic workout! Wow 90 degrees on a hot track!? Kudos to you! I have never done a track race. I think I wouldn’t mind trying it out! Impressive, it was so hot that day! Will you be running any more of the DCRR races for the summer series?